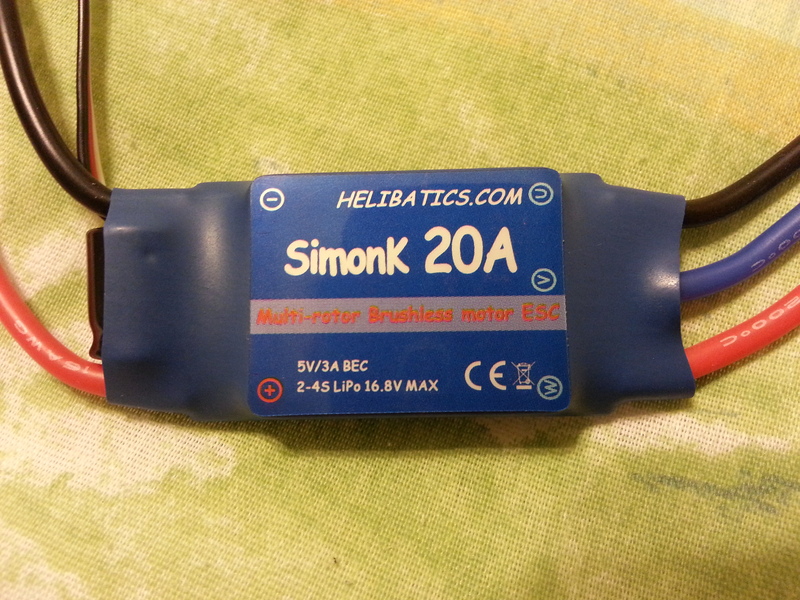 You are looking at a NEW Helibatics SimonK 20Amp ESC with 5V/3A BEC firmware flashed (and tested) for multicopter! temperatures. I don't think there is a better 20A ESC for the price. I investigated and evaluated many of the ESC's available before deciding on this on. I believe it's the best, and I think you will too. With the included SimonK firmware (bs_nfet.hex), these ESC's are perfect for any multicopter device requiring up to 600Hz response, such as a tricopter, quadcopter, hexacopter, or octocopter. These work great with 3DRobotics DIYDrones APM2.X series UAV controllers, DJI Naza, and many others. range like other cheap ESC's). Super high refresh rate, no buffering of the input signal, resulting in up to 600Hz response rate. You can easily upgrade the SimonK firmware yourself using the Hobbyking Turnigy USB Linker. NOTE: Before you buy these, you should make yourself familiar with the somewhat experimental nature of the SimonK firmware. This software pushes the motor response to the limit, so there may be motor and prop combinations that won't work. Due to the lack of overcurrent/overheat/low voltage sensing (needed for multirotors), it's easier to destroy the ESC and possibly the motor too. I'm can't tell you what will or won't work, other than the motors I sell that I've personally used, so please consult the main SimonK threads on various forums for more info. Neither I, nor SimonK will be responsible for any damage that may occur, so know and accept the risks before using these. That said, I've personally had fantastic results with this firmware and wouldn't use anything else! The latest version of SimonK has resolved most if not all known issues, so it is very safe to use. And if you need a different quantity, let me know! You won't be disappointed with these! They are 100% new and tested, as shown in the photos. See the ESC photos with clear shrink to see what the circuit board looks like! (for example only). Buy with confidence knowing that your order will be shipped quickly with tracking and insurance!